I felt I had to do a review of this little number!. I've been reading quite a few mumurings on social networks about the fact that the German bargain store Lidl have an offer on for a VERY cheap ukulele setup. When I say cheap I mean £17.99 cheap. Too good to be true? I had to find out. Now, as you know, I play some nice high end instruments, but am a sucker for a good cheap player. I often plug the greatness of the Makala Dolphin which, when set up well is a fine instrument for very little money. I am also conscious that this is a blog aimed at beginners, and in many cases beginners are not keen throwing too much money on a first ukulele. The downside to that is that there are a LOT of really bad instruments out there. Some so bad they are liable to put you off for life. That is a travesty. Lidl however (like their German cousin Aldi) are famous for offering weekly deals on items at very very low prices. They are renowned for offering everything from power tools to digital cameras, with brands we have never heard of, on one week deals. I read reviews from people that in a lot of cases the quality is actually rather good. You see they buy once, in bulk, and pass on the savings. Could this be done with a ukulele? 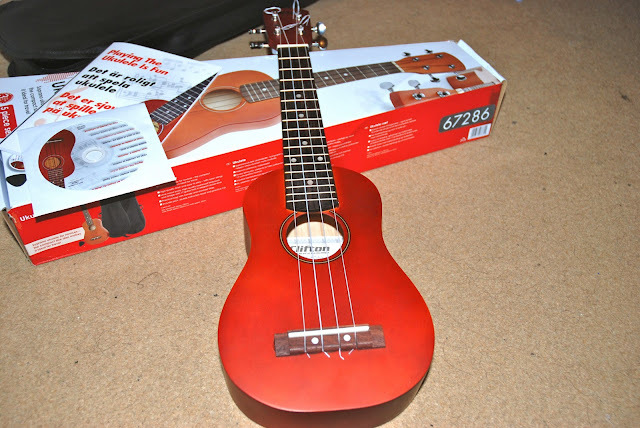 The ukulele comes billed as a "Ukulele set" at Lidl stores for the bargain basement price of £18.99. As part of that boxed set it comes with an instruction guide, CD, "case" and a plectrum. Before we move on to the uke, lets say a little about the other items. The case is not really a case, its a cover - it will protect the uke from nothing but minor knocks. That said it is significantly thicker than the cover that comes with Mahalo and Makala ukes that cost more money, and has a shoulder strap. 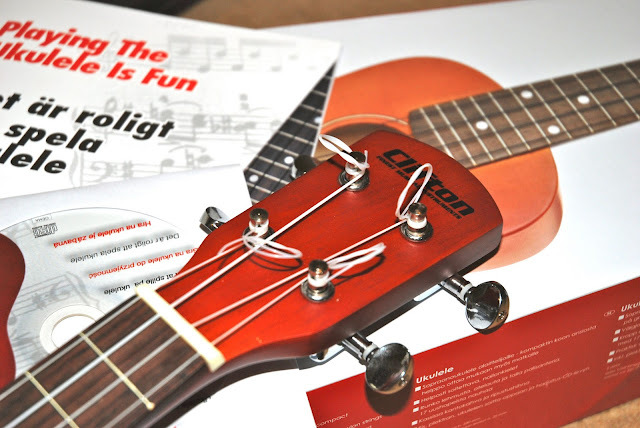 The book is a very simple guide to the uke, tuning, holding etc and comes with some strum patterns for 13 songs. A warning - being German based, the book teaches the tuning of A, D, F#, B. There is nothing wrong with that tuning on a Soprano, but it is nowhere near as common as the GCEA tuning most often found on internet resources. As such if you plan on using the vast amount of tabs on the net with this uke the book is kind of unhelpful, as is the ADFB chord chart in the back. The CD accompanies the book and provides full and playalong versions of the songs in the book. Don't get too excited at the song choices. We are talking more Baa Baa Blacksheep, When The Saints and Old Macdonald than Lady Gaga and Eddie Vedder. Still for beginners and children I suppose its a nice touch. Then there is the pick. Its a thick sharp piece of plastic. I don't like playing uke with a pick but I know some do. Please, please don't use this one - get a much softer flexible pick. This one will take the finish off the instrument in ten minutes. Ok, lets move on to the instrument itself. Its a soprano uke in standard shape. It's billed as being made of "Limewood" (answers on a postcard please) with a rosewood fingerboard. There are no country of origin markings but I'd bet my life its from the far east despite the German wording on the label inside the body. Incidentally that label also says "Hand Made Quality Ukulele".... hmmm, take with a pinch of salt.. The body may well be lime wood, I have no idea - but it IS a full laminate instrument that has a thin matte reddish stain over it. In places the knots or grain in the wood show through, but very randomly and actually end up looking like flaws. The finish is actually quite nice and very smooth and nice to touch - Its a tactile instrument, and certainly a nicer finish to hold than my beloved Makala Dolphin. Sure there are some finish flaws, but I have seen much worse on instruments that cost considerably more. The bridge appears to be made of rosewood in a traditional design with a plastic saddle an two faux mother of pearl markers. There are huge glue drops around the bridge where it is fixed. Incidentally, that slotted bridge as opposed to a tie bridge certainly makes string changes easier for a beginner. Inside looks fairly uninspiring - simple bracing and un notched / un slotted kerfling holding the back and top to the sides. Functional I suppose. Inside the uke smells of glue and paint, not wood. The body on this thing is thick and heavy - clearly this is no delicate instrument and you can feel the thickness and weight immediately. Not a good thing. A thinner body allows the sound to resonate more and provide a better sound. Thick bodies are the hallmark of very cheap instruments and tend to sound limited, muted or boxy. Its a common misconception that a laminate instrument is a bad instrument. That is plain wrong. There is good laminate that can sing and there is bad thick laminate. Now onto the tuners and the first big issue I have. It was nice to see small buttoned tuners (they are geared) on the uke as opposed to the normal mickey mouse ear type favoured by cheap ukes. Turning it over though and .....WHAT? These things are HUGE - I have never seen such enormous, ugly casings for geared tuners. Why couldn't they have just gone with open gears - surely they would have been cheaper and looked far better? Not only are they ugly, that much metal stands a chance of making the uke neck heavy and unbalance. To be fair though, because the body is so heavy, you don't seem to notice, but still, they are horrible. They work equally as horribly. Two of them are extremely loose, one extremely tight, and the other alternates between loose and tight on tuning. That makes for a tricky tuning experience when trying to be precise. They hold tune well, but are a pain to use. Oh well though, that is my first major gripe on an 17.99 uke, and at the end of the day they can easily be changed if you so wished. On to how it sounds. 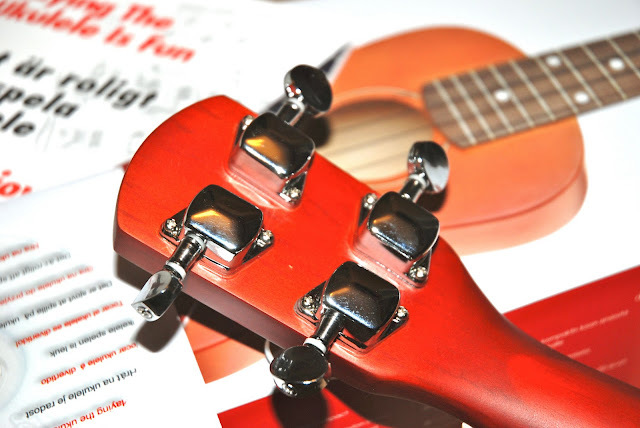 Out of the box this uke is strung with generic 'plasticy' sloppy black nylon strings. I did persist with them (after much stretching) and they (as I suspected) sounded dead and lifeless. They also sounded flat and felt bad on the fingers. Quickly whipped them off and put on a set of trusty Aquila strings. The great thing about Aquilas is that they have a knack of making a cheap instrument come to life. The difference was night and day. Now I am not saying the sound is great - it sound boxy and very one dimensional as a result of all that thick wood in the body, but it works, particularly for rhythm. Volume is also surprisingly good. What stood out most of all though was the action, intonation and general setup. It avoids the common cheap uke fault of a high nut leading to notes going sharp at low frets - in fact the nut height is spot on. Intonation down the neck is pretty great up to the 7th. It then tails off a little to the 10th and gets a bit worse at the 12th upwards. Thats reasonable for this price, and may be improved slightly if I take down the action by lowering the bridge saddle a tiny bit. It's slightly high but acceptable. But generally speaking I am really rather amazed at the setup. No buzzes, no odd notes and good tuning across most of the usable fretboard. Sure, it doesn't "sing" but for learning to play it gets the notes and chords out there adequately. So in a nutshell - its quite an eye opener I suppose. The price point is the cheapest uke I have ever bought, but I will honest and say it is far far better than many other entry level ukes I have played. Its not without its faults at all, and sound wise is no match for the more rounded sweeter sound the Makala Dolphin can create, but its perfectly adequate as a beginner instrument. If you are thinking of getting a first uke, 17.99 may persuade you to do so, and if your model works as well as mine, you may not be disappointed provided you can stomach paying another six pounds for Aquila strings and fitting them yourself. Don't be swayed by the extras included as I don't think they really change the deal. I think I would still suggest paying more and getting a Dolphin from a real music shop and having Aquilas fitted, but I certainly wouldn't knock you for picking one of these up and giving it a go. I would repeat, I have played a LOT worse for more money. Generally nice finish throughout, particularly the neck. As a final note - this review may actually become redundant very quickly - the nature of these cheap weekly deals at Lidl is that after one week they disappear. It may come back into stock, but who knows when. As such, if you want to buy (and I probably would give you a recommendation if you can stomach the string change) is that you have another six days to do so!! To help you further I have included the Clifton in this extensive video comparison of ukulele sounds. I have purchased one of these as a gift...could you possibly explain the Aquilas strings to me as there seem to be different keys 'c' etc,,,not a clue what to get and where from. Also could you recommend a song book or can you use a guitar book? Many thanks appreciate your review and help. Bought one on the 18th. Being my first venture into stringed instruments for nearly 55 years, now 70 (aborted attempt at skiffle guitar), I thought the Uke was well made and sounded fine. But I have sent off for a ses of Aquila strings as suggested. The supplied strings have now started to settle in a bit. I didn'tsee a tuner gadget for sale in Lidl so ended up paying more for the tuner gadget than the uke. I have not played an instument since terrible guitar lessons at primary school, 35 years ago. I think we learned one chord and a kind of tuneless regimented strumming that put everyone off guitars. 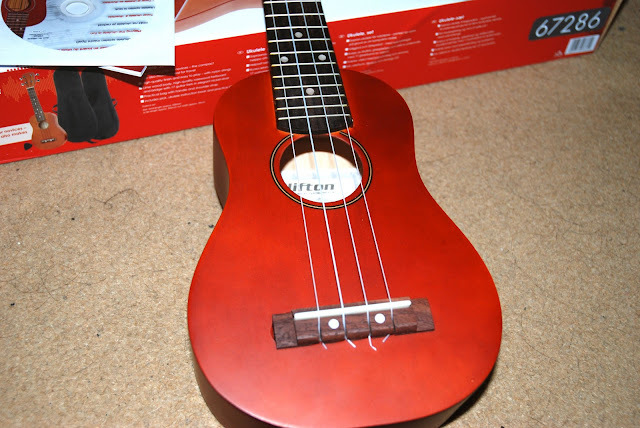 I have been amazed at how nice the Lidl uke sounds now that it is tuned properly. I had expected it to be ok as lidl bargains are usually decent enough, but it has surpassed my expectations. 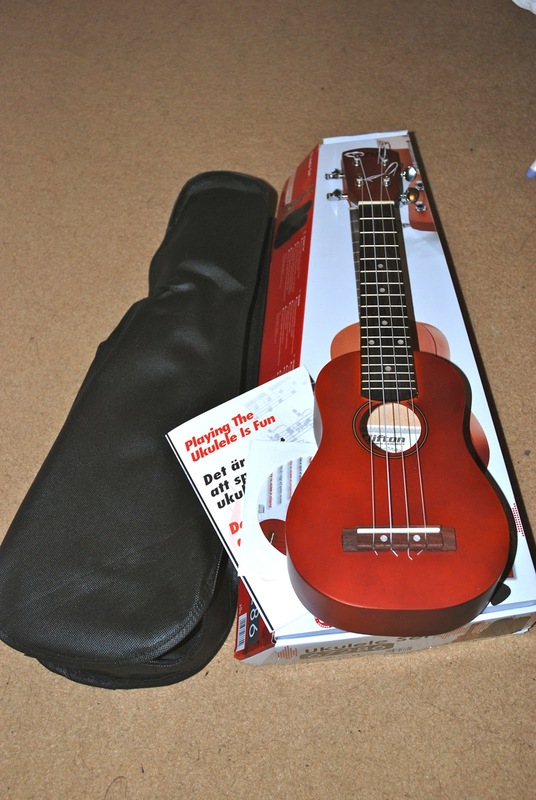 I bought a couple of these Lidl ukes for myself and my son for Christmas, plus Aquila strings and digital tuners online. As 'entry level' instruments for complete beginners keen to have a go and find out if this is something we would like to pursue, I think they are great. Found your review very informative and interesting - and wish I'd seen it before I made the purchase! But thanks anyway. I have just bought a similar instrument at Lidl for £14.99. I say similar in that it is branded "Clifton" but otherwise seems superior to the one reviewed here. I am not a Ukulele expert but have many guitars and have owned many more over the years. This offer's Uke seems to be slightly superior in construction as I wouldn't call the Sapele wood body heavy. The Alder wood neck has 12 frets. Also the tuners are of a peg style rather than the guitar style "Machine heads" on the featured instrument. Once tuned up I was pleasantly surprised at the playability for this astonishingly low price. Yeah, the one reviewed above is a model from earlier in the year. My wife saw this latest model, and bought it. Seems nice but with direct tuning, but your article mentions GCEA tuning and as this ADFB set is fitted. Is it a case of simply changing to Aquila strings GCEA, otherwise an astonishing price. Thank for a wonderful site. Just bought two more of these babies after buying one to see what they are like. I can say that a set of Aquila strings turns this into a nice little uke! I get a nicer sound out of these than my "middle of the road" soprano and concert ukes! I got this ukulele. Complete beginner. I have tuned it up as adfb as in book, but when I look at songs at songs in back of book they have a c in. I.e. a whole tone lower than the d note. am I being stupid, or is that impossible on this tuning? Just an addendum to my earlier post on the November (2012) offer of a Clifton Uke from Lidl... I've fitted Aquilla strings and they really make a huge difference for the better, deeper tone, louder, crisper, and more "Ring." I boguht them specifically because of the deterioration of the intonation of the original strings which "Went off" rather quickly! However this now sounds superb! I brought one of these ukus as an impulse buy knowing nothing about them, quickly added some Aquilla string and now absolutely love it. Playing it is such a joy! 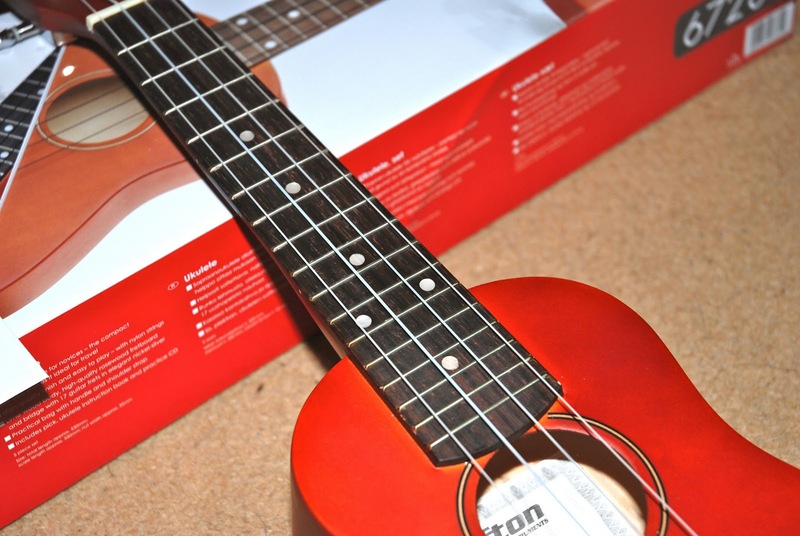 i bought one at Xmas and its the best £18 I've ver spent...lovely sound to it...the guys at the Ukulele club absolutely love it compared to other types which cost £50-200!! Hi Baz, lime wood refers to wood from lime trees (Tillia species). In the US its called Basswood, a wood that is used for packing boxes. But my Fender acoustic guitar is laminate Basswood and it really sings.